I was lucky that I stumbled across this book very early on in my magic development. It had a huge impact on how I approached magic and how I think today about magic. The introductory chapter "The Vernon Touch" should be mandatory reading for every magician. I would go so far as to recommend re-reading it every year. Martin Breese wrote: "One of the most important books of magic ever written." Max Holden said: "I consider Vernon the greatest man with a pack of cards of the present day." Many consider Dai Vernon, the professor, as one who had probably the biggest impact on magic in recent times. Now this one of a kind book is available as ebook, searchable and much cheaper than the print version. Dai Vernon covers a lot of ground with tricks spanning cards, coins, cups and balls, cone and ball, thimbles, rope, even stage effects such as the linking rings and a thumb tie are covered in great detail. This ebook is packed with extremely strong magic. You will not find a single effect which is mediocre. Many detailed photographs show Vernon and Vernon's hands in action. CHAPTER ONE. -- BACKGROUND TO A LEGEND. A short biography of Dai Vernon - a magician who has become a legend in his own lifetime. CHAPTER TWO. -- THE VERNON TOUCH. 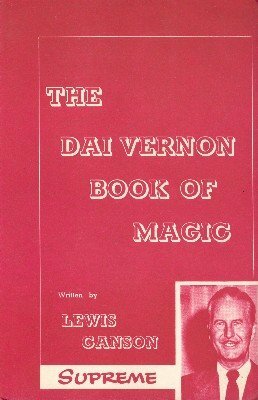 Dai Vernon reveals the methods he employs for the evolution and performance of his magic - the magician's line of thought when studying a new trick - the approach to original presentation - advice on naturalness of action - adapting a trick to suit one's own style and personality - conditions of performance - practice - simplification of handling - lessons to be learnt from great magicians of the past and present. CHAPTER THREE. -- A CHINESE CLASSIC. Dai Vernon's superb routine for "The Coins through the Table". Three coins pass through a solid table top - the handling is so natural and the method so subtle, that the effect appears to be real magic, especially when the magician repeats the penetration under seemingly impossible conditions. CHAPTER FOUR. -- PENETRATION OF THOUGHT. A card which is merely thought of by a spectator passes from a packet of cards held by the performer to another packet held by the spectator. An intriguing feature is that the spectator does not reveal the name of the card until the last moment, when a card with a different coloured back is seen to have appeared in the packet he has been holding. When turned over, this card proves to be the one just named. An original Dai Vernon effect brought about by subtle means. CHAPTER FIVE. -- THREE BALL TRANSPOSITION. Dai Vernon's famous routine in which three solid balls travel mysteriously from one hand to the other. The effect is repeated continuously with interesting variations; even when balls are placed in the pocket, they travel back into the hands. Finally, the balls vanish completely. The moves are so cleverly conceived that, although the handling is simple, the effect is truly magical. This routine is suitable for performance as a close-up item or before quite large audiences, as two spectators hold a close-mesh net stretched between them into which the balls are allowed to fall. This enables the effect to be clearly seen and appreciated from a distance. CHAPTER SIX. -- APPLICATION OF THE TENKAI PALM. The clever magician, Tenkai, has evolved a unique method for palming a card. By employing this method of palming, Dai Vernon has originated two new sleights. One is a startling colour-change which he has called "SVENGALI" because the card seems to change through an hypnotic gesture, and the other is a subtle method for secretly exchanging one card for another. By utilizing the latter sleight, he has built a routine, the basic effect of which is the transposition of two cards. Only two cards are seen the whole time, a Jack and an Ace - the Jack is rested against a wine-glass on the table but jumps back to the hand of the performer - hence the title "JUMPING JACK". This is the routine which has brought so much comment from well-informed card specialists - many contending that the effect could only be brought about by the use of a mechanical "hold-out". Here is the true method revealed in print for the first time. CHAPTER SEVEN. -- THE LINKING RINGS. Delightful moves with the Linking Rings which will enhance any routine. These include SPINNING THE RINGS - when a single ring is linked to the key-ring, this move makes it appear that the performer spins both rings; THE CRASH LINKING - rings are linked together through any point in their circumference; THE PULL-THROUGH METHOD OF UNLINKING - a spectacular method of unlinking a single ring from the key-ring, the appearance being that one ring is actually pulled through the other; THE FALLING RING - the top ring of a chain tumbles down from ring to ring until it spins from the bottom ring. CHAPTER EIGHT. -- SEVEN CARD MONTE. From a pack of cards, six black cards and a red court card are dealt in a row, face up, on the table. The red court card is in the centre of the row. Three of the black cards are turned face down; the packet of cards is squared, then turned over. Once again the cards are placed on the table, but this time, of course, the face of the red court card will not be seen, as it is now one of the face-down cards. A spectator is asked to place one hand over the remainder of the pack of cards, then to guess which is the court card - he fails three times. Because each card has been turned face up after the spectator's choice, all cards are now face up - the court card has vanished, but when the spectator lifts his hand, that card is found on top of the pack. The effect is repeated, and, and even though the spectator tries to catch the performer by peeking at the top card of the pack, the court card vanishes once more and is found on top of the pack. It would be difficult to find a card trick which can be performed under such conditions to equal the effect of SEVEN CARD MONTE. CHAPTER NINE. -- QUICK TRICKS. Often some small piece of trickery will steal the limelight from more elaborate illusions. This chapter contains several tricks which, although the performing time is short, are extremely effective. LEIPZIG'S COIN ON THE KNEE. This unusual method of causing a coin to vanish is particularly effective and amusing. MARTIN GARDNER'S CIGAR VANISH. A lighted cigar vanishes from under a handkerchief by one of the "cheekiest" moves ever conceived. DAI VERNON'S FIVE COIN STAR. Five coins appear, each one seen separately between the tips of the extended fingers and thumbs of the hands which are held together, palm to palm - the handling has been so simplified that it can be learnt quickly. DAI VERNON'S "PICK OFF PIP". Showing a three-spot card on the face of the pack, the performer picks off the centre spot. DAI VERNON'S ADAPTATION OF BILL BOWMAN'S "CLIPPED". A trick with a story in which a note secured by two paper clips and a loop of string comes free, leaving the clips and loop all linked together. CLIFF GREEN'S MULTIPLE COLOUR CHANGE. The face card of a pack changes rapidly time and time again. MALINI-VERNON "THREE COINS FROM ONE". A borrowed coin has two other coins "broken" from it - a wonderful example of maximum effect achieved by simple means. CHAPTER TEN. -- EXPANSION OF TEXTURE. Dai Vernon's original routine, in which a copper and a silver coin are placed inside a handkerchief, the corners of which are held by a spectator. At the request of the spectator, either the copper or silver coin is removed magically, leaving the remaining coin to be removed by the spectator. Offering to reverse the process, the performer places the silver coin only in the handkerchief, then asks the spectator to grasp the coin through the handkerchief and hold the four corners of the handkerchief in his other hand. Taking the copper coin, the performer causes it to vanish, when it is heard to clink against the coin in the handkerchief. On opening the handkerchief, the spectator finds both coins inside. A classical effect achieved by subtle and simple moves. CHAPTER ELEVEN. -- THE CHALLENGE. In this fine effect, the performer shows the faces of two cards, then places them about two feet apart, face downwards, on the table. A spectator is requested to think of one of the cards and the performer wagers that he will state which card is in the spectator's thoughts. At the outset, it appears that the performer is merely taking a two-to-one chance, but when, as the effect is repeated, he is constantly correct, the mystery deepens, especially as no questions are asked throughout the demonstration. In addition, there is a novel and amusing climax to the trick which builds it up into an exceptionally strong item. This is one of Dai Vernon's tricks which is a particular favourite with his friend Faucett Ross. CHAPTER TWELVE. -- DAI VERNON'S DOUBLE LIFT. The Double Lift is one of the most useful sleights in card magic. Dai Vernon reveals his own method, which allows the cards to be handled in an apparently casual and natural manner. CHAPTER THIRTEEN. -- THE CUPS AND BALLS. Here is Dai Vernon's wonderful routine in which there is no over-elaboration; it has been kept simple, both in plot and handling. The audience is in no doubt as to what has happened or is happening, although they are given no clue as to how it is accomplished. Everything appears to be free from trickery, the props are simple, the movements of the performer natural; there is no clever hand-play which could be interpreted as sleight of hand, so that, as each phase of the plot unfolds, the audience becomes more bewildered. When finally the cups are lifted to disclose an apple, an onion and a lemon, then they are prepared to admit that they have witnessed the ultimate in magic. Surely this is the finest routine with the Cups and Balls ever evolved. CHAPTER FOURTEEN. -- NATE LEIPZIG'S CARD STAB. It was Dai Vernon's particular wish that this chapter should be included in his book, as he was anxious that certain subtleties that Leipzig disclosed to him, and which had been omitted from previously published versions of the card stab, should be credited to the originator. This is the true version of the Leipzig Card Stab as taught to Dai Vernon by Leipzig himself. The originator left nothing to chance in his magic and included no difficult sleight of hand. His effects were obtained by subtle methods and naturalness of action, and this routine exemplifies Leipzig at his very best. CHAPTER FIFTEEN. -- TIPS ON KNOTS. Interesting and entertaining magical effects, in which knots apparently tie and untie themselves, are popular features in many performer's acts. In this chapter Dai Vernon reveals three original knot effects. DAI VERNON'S FALSE KNOT. A knot is tied in the centre of a silk handkerchief. The performer strikes the knot with his extended forefinger, which causes the knot to vanish. DAI VERNON'S METHOD FOR UPSETTING A SQUARE KNOT. A new and natural-looking method for upsetting a knot. Ideal for such tricks as The Sympathetic Silks, Multiple Knots, etc. SPLITTING THE ATOM. Two silks are firmly tied together; a click is heard and the knot splits in two, causing the silks to fall apart. CHAPTER SIXTEEN. -- SIX CARD REPEAT. Dai Vernon's entirely new and original method for performing this popular and entertaining card trick, in which apparently no matter how often the performer removes three cards from six he still has six cards left. When Dai Vernon performs this trick it causes a riot of fun. He reveals his own simplified handling of the moves by which he causes coins to appear under several articles on a table. His climax is particularly entertaining, as coins apparently appear faster than he can pick them up and stuff them into his pockets. CHAPTER EIGHTEEN. -- MENTAL SPELL. After shuffling and cutting the pack, the performer removes ten cards, which he hands to a spectator with the request that any one card be thought of. Now the spectator is asked to mentally spell the name of his card. This is done without a word being spoken, the spectator removing a card from the top of the packet and placing it on the bottom for every letter in the name of his mentally selected card. At the conclusion of the mental spell, the performer reveals the spectator's card in a startling manner. CHAPTER NINETEEN. -- POT POURRI. This chapter contains several items of Dai Vernon's magic which are either not complete tricks in themselves, or, if complete, are not of sufficient descriptive length to form a chapter on their own. DAI VERNON'S CLIMAX FOR A DICE ROUTINE. A beautiful series of moves which provide an excellent climax for any dice routine. DAI VERNON'S "ONE UNDER AND ONE DOWN". A spectator hands the performer ANY ten cards from the pack, then names any one of them. Leaving the cards in exactly the same order as they were handed to him, the performer places the top card to the bottom and the next card on the table and repeats these actions until one card remains. It is the named card. CHARLES MILLER'S CUPS AND BALLS MOVE. A beautiful move which can be incorporated into any Cups and Balls routine. Originated by this fine magician, who is a great friend of Dai Vernon. WELSH MILLER'S CARDS AND MATCHES. A fine routine with three cards and three match-sticks. The matches vanish, appear and multiply under the cards in the same way as the balls in a Cups and Balls routine. An excellent item of impromptu magic. TIPS FOR EXPERTS. Dai Vernon reveals several all-important but little known tips for the improvement of certain sleights with cards and coins. CHAPTER TWENTY. -- BALL, CONE AND HANDKERCHIEF. This is the exquisite routine which was a feature of Dai Vernon's famous Harlequin Act. The performer removes a silk handkerchief from his pocket and draws it through his otherwise empty hands - a large white ball appears from the corner of the handkerchief. After draping the handkerchief over his left hand, he places the ball on the palm and covers it with the cone. The cone and handkerchief are tossed into the air - the ball has vanished, but is found in the performer's pocket. A series of vanishes and reappearances of the ball now take place and during the process it changes colour from white to red, then back again to white. Eventually the empty cone is placed on the table and the ball is wrapped in the handkerchief - but it penetrates the centre of the handkerchief. Again it is wrapped up securely, but this time it vanishes completely. However, the ball, like a homing pigeon, has returned once more to its hiding place under the cone on the table. CHAPTER TWENTY-ONE. -- THE LAST TRICK OF DR. JACOB DALEY. During the last months of Dr. Daley's life he evolved another of his excellent card tricks, which he demonstrated for Dai Vernon. Dai Vernon was a very close friend of the Doctor's, and includes this trick in his book as a tribute to a great magician. This is a routine with just the four Aces - a perfect transposition of the black and red Aces. The handling is so clean and natural in appearance that there appears to be no opportunity for trickery - a fine effect by a master magician. CHAPTER TWENTY-TWO. -- PAUL ROSINI'S IMPROMPTU THIMBLE ROUTINE. This was one of the favourite impromptu effects of Paul Rosini. A thimble jumps from the forefinger of the performer's right hand on to the forefinger of his left hand - then back and forth. The performer confesses that he uses more than one thimble - and reveals five thimbles, one on each finger and one on the thumb of his right hand. He now causes them to jump singly from his right hand on to the fingers and thumb of his left hand, and finishes by dropping each thimble singly into a glass. CHAPTER TWENTY-THREE. -- THE VERNON POKER DEMONSTRATION. This is a most entertaining demonstration in which the performer offers to show the methods employed by crooked gamblers when playing Poker. Although the spectators are shown that cards are stacked during a shuffle and see the performer deal himself four Aces, they still cannot understand why those cards should turn up in the dealer's hand. However, the performer repeats the effect, and eventually every hand is a good one - but the dealer has a Royal Flush. Dai Vernon employs subtle but simple methods to bring about his effect and has evolved a routine which holds the interest of the audience from start to finish. CHAPTER TWENTY-FOUR. -- THE THUMB TIE. Dai Vernon credits Ten Ichi and Paul Rosini with the subject matter of this chapter, but undoubtedly he has enhanced the routine with the "Vernon Touch"! Here is the most convincing method of all for having a spectator tie the performer's thumbs together, and a really first-class routine which has been a feature of Dai Vernon's act for many years. Every detail is given, so that there will be no difficulty in understanding every move.